A zinc finger is a small protein structural motif that is characterized by the coordination of one or more zinc ions (Zn2+) in order to stabilize the fold. Originally coined to describe the finger-like appearance of a hypothesized structure from Xenopus laevis transcription factor IIIA, the zinc finger name has now come to encompass a wide variety of differing protein structures. Xenopus laevis TFIIIA was originally demonstrated to contain zinc and require the metal for function in 1983, the first such reported zinc requirement for a gene regulatory protein. Since their original discovery and the elucidation of their structure, these interaction modules have proven ubiquitous in the biological world and may be found in 3% of the genes of the human genome. In addition, zinc fingers have become extremely useful in various therapeutic and research capacities. Engineering zinc fingers to have an affinity for a specific sequence is an area of active research, and zinc finger nucleases and zinc finger transcription factors are two of the most important applications of this to be realized to date. Zinc fingers were first identified in a study of transcription in the African clawed frog, Xenopus laevis in the laboratory of Aaron Klug. A study of the transcription of a particular RNA sequence revealed that the binding strength of a small transcription factor (transcription factor IIIA; TFIIIA) was due to the presence of zinc-coordinating finger-like structures. Amino acid sequencing of TFIIIA revealed nine tandem sequences of 30 amino acids, including two invariant pairs of cysteine and histidine residues. Extended x-ray absorption fine structure confirmed the identity of the zinc ligands: two cysteines and two histidines. The DNA-binding loop formed by the coordination of these ligands by zinc were thought to resemble fingers, hence the name. More recent work in the characterization of proteins in various organisms has revealed the importance of zinc ions in polypeptide stabilization. The crystal structures of zinc finger-DNA complexes solved in 1991 and 1993 revealed the canonical pattern of interactions of zinc fingers with DNA. The binding of zinc finger is found to be distinct from many other DNA-binding proteins that bind DNA through the 2-fold symmetry of the double helix, instead zinc fingers are linked linearly in tandem to bind nucleic acid sequences of varying lengths. Zinc fingers often bind to a sequence of DNA known as the GC box. The modular nature of the zinc finger motif allows for a large number of combinations of DNA and RNA sequences to be bound with high degree of affinity and specificity, and is therefore ideally suited for engineering protein that can be targeted to and bind specific DNA sequences. In 1994, it was shown that an artificially-constructed three-finger protein can block the expression of an oncogene in a mouse cell line. Zinc fingers fused to various other effector domains, some with therapeutic significance, have since been constructed. Zinc finger (Znf) domains are relatively small protein motifs that contain multiple finger-like protrusions that make tandem contacts with their target molecule. Some of these domains bind zinc, but many do not, instead binding other metals such as iron, or no metal at all. For example, some family members form salt bridges to stabilise the finger-like folds. They were first identified as a DNA-binding motif in transcription factor TFIIIA from Xenopus laevis (African clawed frog), however they are now recognised to bind DNA, RNA, protein, and/or lipid substrates. Their binding properties depend on the amino acid sequence of the finger domains and on the linker between fingers, as well as on the higher-order structures and the number of fingers. Znf domains are often found in clusters, where fingers can have different binding specificities. Znf motifs occur in several unrelated protein superfamilies, varying in both sequence and structure. They display considerable versatility in binding modes, even between members of the same class (e.g., some bind DNA, others protein), suggesting that Znf motifs are stable scaffolds that have evolved specialised functions. For example, Znf-containing proteins function in gene transcription, translation, mRNA trafficking, cytoskeleton organization, epithelial development, cell adhesion, protein folding, chromatin remodeling, and zinc sensing, to name but a few. Zinc-binding motifs are stable structures, and they rarely undergo conformational changes upon binding their target. ^ a b Klug A, Rhodes D (1987). 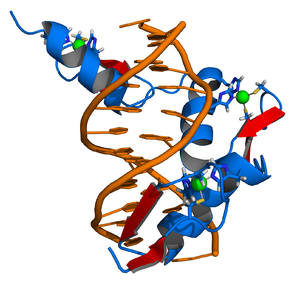 "Zinc fingers: a novel protein fold for nucleic acid recognition". Cold Spring Harbor Symposia on Quantitative Biology. 52: 473–82. doi:10.1101/sqb.1987.052.01.054. PMID 3135979. ^ Hanas JS, Hazuda DJ, Bogenhagen DF, Wu FY, Wu CW (December 1983). "Xenopus transcription factor A requires zinc for binding to the 5 S RNA gene". The Journal of Biological Chemistry. 258 (23): 14120–5. PMID 6196359. ^ Berg JM (April 1990). "Zinc fingers and other metal-binding domains. Elements for interactions between macromolecules". The Journal of Biological Chemistry. 265 (12): 6513–6. PMID 2108957. ^ Miller J, McLachlan AD, Klug A (June 1985). "Repetitive zinc-binding domains in the protein transcription factor IIIA from Xenopus oocytes". The EMBO Journal. 4 (6): 1609–14. PMC 554390  . PMID 4040853. ^ Miller Y, Ma B, Nussinov R (May 2010). "Zinc ions promote Alzheimer Abeta aggregation via population shift of polymorphic states". Proceedings of the National Academy of Sciences of the United States of America. 107 (21): 9490–5. Bibcode:2010PNAS..107.9490M. doi:10.1073/pnas.0913114107. PMC 2906839  . PMID 20448202. ^ Low LY, Hernández H, Robinson CV, O'Brien R, Grossmann JG, Ladbury JE, Luisi B (May 2002). "Metal-dependent folding and stability of nuclear hormone receptor DNA-binding domains". Journal of Molecular Biology. 319 (1): 87–106. doi:10.1016/S0022-2836(02)00236-X. PMID 12051939. ^ a b c Pavletich NP, Pabo CO (May 1991). "Zinc finger-DNA recognition: crystal structure of a Zif268-DNA complex at 2.1 A". Science. 252 (5007): 809–17. Bibcode:1991Sci...252..809P. doi:10.1126/science.2028256. PMID 2028256. ^ Fairall L, Schwabe JW, Chapman L, Finch JT, Rhodes D (December 1993). "The crystal structure of a two zinc-finger peptide reveals an extension to the rules for zinc-finger/DNA recognition". Nature. 366 (6454): 483–7. Bibcode:1993Natur.366..483F. doi:10.1038/366483a0. PMID 8247159. ^ Lundin, M.; Nehlin, J. O.; Ronne, H. (1994-03-01). "Importance of a flanking AT-rich region in target site recognition by the GC box-binding zinc finger protein MIG1". Molecular and Cellular Biology. 14 (3): 1979–1985. doi:10.1128/MCB.14.3.1979. ISSN 0270-7306. PMC 358557  . PMID 8114729. ^ Klug A (October 1999). "Zinc finger peptides for the regulation of gene expression". Journal of Molecular Biology. 293 (2): 215–8. doi:10.1006/jmbi.1999.3007. PMID 10529348. ^ Hall TM (June 2005). "Multiple modes of RNA recognition by zinc finger proteins". Current Opinion in Structural Biology. 15 (3): 367–73. doi:10.1016/j.sbi.2005.04.004. PMID 15963892. ^ Brown RS (February 2005). "Zinc finger proteins: getting a grip on RNA". Current Opinion in Structural Biology. 15 (1): 94–8. doi:10.1016/j.sbi.2005.01.006. PMID 15718139. ^ Gamsjaeger R, Liew CK, Loughlin FE, Crossley M, Mackay JP (February 2007). "Sticky fingers: zinc-fingers as protein-recognition motifs". Trends in Biochemical Sciences. 32 (2): 63–70. doi:10.1016/j.tibs.2006.12.007. PMID 17210253. ^ Matthews JM, Sunde M (December 2002). "Zinc fingers--folds for many occasions". IUBMB Life. 54 (6): 351–5. doi:10.1080/15216540216035. PMID 12665246. ^ a b Krishna SS, Majumdar I, Grishin NV (January 2003). "Structural classification of zinc fingers: survey and summary". Nucleic Acids Research. 31 (2): 532–50. doi:10.1093/nar/gkg161. PMC 140525  . PMID 12527760. ^ a b Pabo CO, Peisach E, Grant RA (2001). "Design and selection of novel Cys2His2 zinc finger proteins". Annual Review of Biochemistry. 70: 313–40. doi:10.1146/annurev.biochem.70.1.313. PMID 11395410. ^ a b c Jamieson AC, Miller JC, Pabo CO (May 2003). "Drug discovery with engineered zinc-finger proteins". Nature Reviews. Drug Discovery. 2 (5): 361–8. doi:10.1038/nrd1087. PMID 12750739. ^ Liu Q, Segal DJ, Ghiara JB, Barbas CF (May 1997). "Design of polydactyl zinc-finger proteins for unique addressing within complex genomes". Proceedings of the National Academy of Sciences of the United States of America. 94 (11): 5525–30. Bibcode:1997PNAS...94.5525L. doi:10.1073/pnas.94.11.5525. PMC 20811  . PMID 9159105. ^ a b Shukla VK, Doyon Y, Miller JC, DeKelver RC, Moehle EA, Worden SE, Mitchell JC, Arnold NL, Gopalan S, Meng X, Choi VM, Rock JM, Wu YY, Katibah GE, Zhifang G, McCaskill D, Simpson MA, Blakeslee B, Greenwalt SA, Butler HJ, Hinkley SJ, Zhang L, Rebar EJ, Gregory PD, Urnov FD (May 2009). "Precise genome modification in the crop species Zea mays using zinc-finger nucleases". Nature. 459 (7245): 437–41. Bibcode:2009Natur.459..437S. doi:10.1038/nature07992. PMID 19404259. ^ Reynolds IJ, Miller RJ (December 1988). "[3H]MK801 binding to the N-methyl-D-aspartate receptor reveals drug interactions with the zinc and magnesium binding sites". The Journal of Pharmacology and Experimental Therapeutics. 247 (3): 1025–31. PMID 2849655. ^ Carroll D (November 2008). "Progress and prospects: zinc-finger nucleases as gene therapy agents". Gene Therapy. 15 (22): 1463–8. doi:10.1038/gt.2008.145. PMC 2747807  . PMID 18784746. ^ Geurts AM, Cost GJ, Freyvert Y, Zeitler B, Miller JC, Choi VM, Jenkins SS, Wood A, Cui X, Meng X, Vincent A, Lam S, Michalkiewicz M, Schilling R, Foeckler J, Kalloway S, Weiler H, Ménoret S, Anegon I, Davis GD, Zhang L, Rebar EJ, Gregory PD, Urnov FD, Jacob HJ, Buelow R (July 2009). "Knockout rats via embryo microinjection of zinc-finger nucleases". Science. 325 (5939): 433. Bibcode:2009Sci...325..433G. doi:10.1126/science.1172447. PMC 2831805  . PMID 19628861. ^ Tebas P, Stein D (2009). "Autologous T-Cells Genetically Modified at the CCR5 Gene by Zinc Finger Nucleases SB-728 for HIV". ClinicalTrials.gov. ^ Christy B, Nathans D (November 1989). "DNA binding site of the growth factor-inducible protein Zif268". Proceedings of the National Academy of Sciences of the United States of America. 86 (22): 8737–41. Bibcode:1989PNAS...86.8737C. doi:10.1073/pnas.86.22.8737. PMC 298363  . PMID 2510170. ^ Rebar EJ, Pabo CO (February 1994). "Zinc finger phage: affinity selection of fingers with new DNA-binding specificities". Science. 263 (5147): 671–3. Bibcode:1994Sci...263..671R. doi:10.1126/science.8303274. PMID 8303274. ^ Jamieson AC, Kim SH, Wells JA (May 1994). "In vitro selection of zinc fingers with altered DNA-binding specificity". Biochemistry. 33 (19): 5689–95. doi:10.1021/bi00185a004. PMID 8180194. ^ Choo Y, Klug A (November 1994). "Toward a code for the interactions of zinc fingers with DNA: selection of randomized fingers displayed on phage". Proceedings of the National Academy of Sciences of the United States of America. 91 (23): 11163–7. Bibcode:1994PNAS...9111163C. doi:10.1073/pnas.91.23.11163. PMC 45187  . PMID 7972027. ^ Wu H, Yang WP, Barbas CF (January 1995). "Building zinc fingers by selection: toward a therapeutic application". Proceedings of the National Academy of Sciences of the United States of America. 92 (2): 344–8. Bibcode:1995PNAS...92..344W. doi:10.1073/pnas.92.2.344. PMC 42736  . PMID 7831288. ^ Kim JS, Lee HJ, Carroll D (February 2010). "Genome editing with modularly assembled zinc-finger nucleases". Nature Methods. 7 (2): 91; author reply 91–2. doi:10.1038/nmeth0210-91a. PMC 2987589  . PMID 20111032. ^ Joung JK, Voytas DF, Cathomen T (February 2010). "Reply to "Genome editing with modularly assembled zinc-finger nucleases"". Nat. Methods. 7 (2): 91–2. doi:10.1038/nmeth0210-91b. PMC 2987589  . ^ Segal DJ, Dreier B, Beerli RR, Barbas CF (March 1999). "Toward controlling gene expression at will: selection and design of zinc finger domains recognizing each of the 5'-GNN-3' DNA target sequences". Proceedings of the National Academy of Sciences of the United States of America. 96 (6): 2758–63. Bibcode:1999PNAS...96.2758S. doi:10.1073/pnas.96.6.2758. PMC 15842  . PMID 10077584. ^ Dreier B, Fuller RP, Segal DJ, Lund CV, Blancafort P, Huber A, Koksch B, Barbas CF (October 2005). "Development of zinc finger domains for recognition of the 5'-CNN-3' family DNA sequences and their use in the construction of artificial transcription factors". The Journal of Biological Chemistry. 280 (42): 35588–97. doi:10.1074/jbc.M506654200. PMID 16107335. ^ Dreier B, Beerli RR, Segal DJ, Flippin JD, Barbas CF (August 2001). "Development of zinc finger domains for recognition of the 5'-ANN-3' family of DNA sequences and their use in the construction of artificial transcription factors". The Journal of Biological Chemistry. 276 (31): 29466–78. doi:10.1074/jbc.M102604200. PMID 11340073. ^ Bae KH, Kwon YD, Shin HC, Hwang MS, Ryu EH, Park KS, Yang HY, Lee DK, Lee Y, Park J, Kwon HS, Kim HW, Yeh BI, Lee HW, Sohn SH, Yoon J, Seol W, Kim JS (March 2003). "Human zinc fingers as building blocks in the construction of artificial transcription factors". Nature Biotechnology. 21 (3): 275–80. doi:10.1038/nbt796. PMID 12592413. ^ Ramirez CL, Foley JE, Wright DA, Müller-Lerch F, Rahman SH, Cornu TI, Winfrey RJ, Sander JD, Fu F, Townsend JA, Cathomen T, Voytas DF, Joung JK (May 2008). "Unexpected failure rates for modular assembly of engineered zinc fingers". Nature Methods. 5 (5): 374–5. doi:10.1038/nmeth0508-374. PMID 18446154. ^ Kim HJ, Lee HJ, Kim H, Cho SW, Kim JS (July 2009). "Targeted genome editing in human cells with zinc finger nucleases constructed via modular assembly". Genome Research. 19 (7): 1279–88. doi:10.1101/gr.089417.108. PMC 2704428  . PMID 19470664. ^ Sander JD, Dahlborg EJ, Goodwin MJ, Cade L, Zhang F, Cifuentes D, Curtin SJ, Blackburn JS, Thibodeau-Beganny S, Qi Y, Pierick CJ, Hoffman E, Maeder ML, Khayter C, Reyon D, Dobbs D, Langenau DM, Stupar RM, Giraldez AJ, Voytas DF, Peterson RT, Yeh JR, Joung JK (January 2011). "Selection-free zinc-finger-nuclease engineering by context-dependent assembly (CoDA)". Nature Methods. 8 (1): 67–9. doi:10.1038/nmeth.1542. PMC 3018472  . PMID 21151135. ^ Greisman HA, Pabo CO (January 1997). "A general strategy for selecting high-affinity zinc finger proteins for diverse DNA target sites". Science. 275 (5300): 657–61. doi:10.1126/science.275.5300.657. PMID 9005850. ^ Maeder ML, Thibodeau-Beganny S, Osiak A, Wright DA, Anthony RM, Eichtinger M, Jiang T, Foley JE, Winfrey RJ, Townsend JA, Unger-Wallace E, Sander JD, Müller-Lerch F, Fu F, Pearlberg J, Göbel C, Dassie JP, Pruett-Miller SM, Porteus MH, Sgroi DC, Iafrate AJ, Dobbs D, McCray PB, Cathomen T, Voytas DF, Joung JK (July 2008). "Rapid "open-source" engineering of customized zinc-finger nucleases for highly efficient gene modification". Molecular Cell. 31 (2): 294–301. doi:10.1016/j.molcel.2008.06.016. PMC 2535758  . PMID 18657511. ^ Smith AT, Tucker-Samaras SD, Fairlamb AH, Sullivan WJ (December 2005). "MYST family histone acetyltransferases in the protozoan parasite Toxoplasma gondii". Eukaryotic Cell. 4 (12): 2057–65. doi:10.1128/EC.4.12.2057-2065.2005. PMC 1317489  . PMID 16339723. ^ Akhtar A, Becker PB (February 2001). "The histone H4 acetyltransferase MOF uses a C2HC zinc finger for substrate recognition". EMBO Reports. 2 (2): 113–8. doi:10.1093/embo-reports/kve022. PMC 1083818  . PMID 11258702. ^ Kim JG, Armstrong RC, v Agoston D, Robinsky A, Wiese C, Nagle J, Hudson LD (October 1997). "Myelin transcription factor 1 (Myt1) of the oligodendrocyte lineage, along with a closely related CCHC zinc finger, is expressed in developing neurons in the mammalian central nervous system". Journal of Neuroscience Research. 50 (2): 272–90. doi:10.1002/(SICI)1097-4547(19971015)50:2<272::AID-JNR16>3.0.CO;2-A. PMID 9373037. ^ Jandrig B, Seitz S, Hinzmann B, Arnold W, Micheel B, Koelble K, Siebert R, Schwartz A, Ruecker K, Schlag PM, Scherneck S, Rosenthal A (December 2004). "ST18 is a breast cancer tumor suppressor gene at human chromosome 8q11.2". Oncogene. 23 (57): 9295–302. doi:10.1038/sj.onc.1208131. PMID 15489893. The zinc knuckle is a zinc binding motif composed of the the following CX2CX4HX4C where X can be any amino acid. The motifs are mostly from retroviral gag proteins (nucleocapsid). Prototype structure is from HIV. Also contains members involved in eukaryotic gene regulation, such as C. elegans GLH-1. Structure is an 18-residue zinc finger. where X can be any amino acid, and number indicates the number of residues. These 18 residues CCHC zinc finger domains are mainly found in the nucleocapsid protein of retroviruses. It is required for viral genome packaging and for early infection process [PUBMED:17416621, PUBMED:17202191, PUBMED:17029416]. It is also found in eukaryotic proteins involved in RNA binding or single-stranded DNA binding [PUBMED:15937226]. This superfamily has zinc-finger domains from GAG proteins, HIV nucleocapsids, nucleocapsid proteins from mason-pfizer monkey virus, and from other nucleic-acid binding proteins. Sometimes the domains appears in duplicate. For those sequences which have a structure in the Protein DataBank, we use the mapping between UniProt, PDB and Pfam coordinate systems from the PDBe group, to allow us to map Pfam domains onto UniProt sequences and three-dimensional protein structures. The table below shows the structures on which the zf-CCHC domain has been found. There are 80 instances of this domain found in the PDB. Note that there may be multiple copies of the domain in a single PDB structure, since many structures contain multiple copies of the same protein sequence.